Now that winter knocking the door,people with normal to sensitive skin are always looking for cleansers that are mild and soothing on skin .Today I am going tell you all about once such amazing facewash from Vedantika Herbals .This face wash contains Rose Flower Oil which treats dry and sensitive skin,Sandal Wood Oil that draws out the excessive heat and keeps the skin cool and Aloe Vera Gel which promotes cell growth and healing. 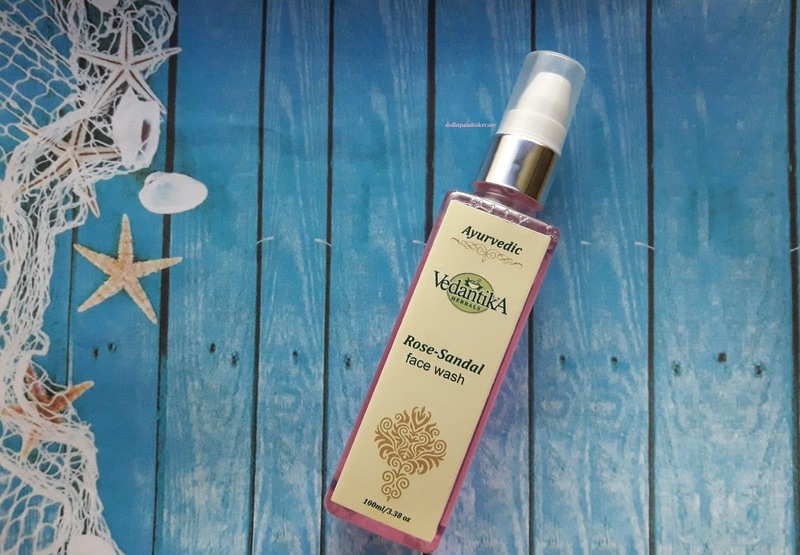 Established in 1997, Vedantika is known for being a purely organic company that aunched many innovative products in the market. All products have the highest level of purity without using any chemical preservatives, synthetic colours and fragrances. For more details and products,you can check out their Website and Facebook Page. This mild cleanser comes from the finest botanicals to wash away dirt and oil, leaving skin clean and fresh. 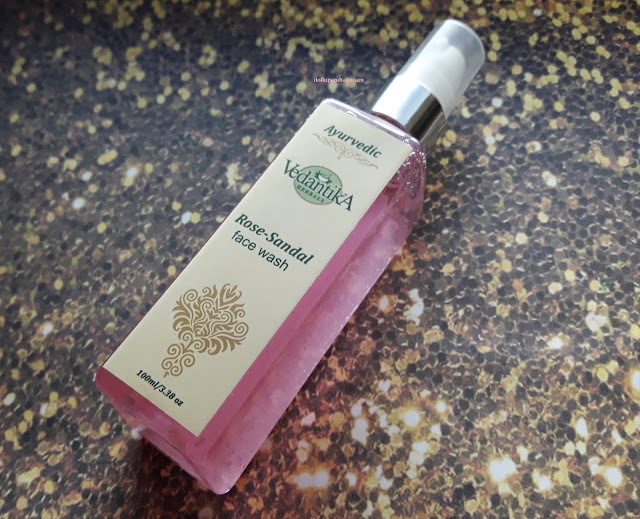 The healing properties of Sandal wood oil repair skin and soothe irritation while steam distilled, pure essential rose oil improves blood circulation. making face softens and brightens the skin. Rosa, Santalum Album, Crocus Sativus, Purified Water & Gel base Q.S. Packaging: The face wash comes in a transparent plastic bottle that has a white pump dispenser. The packaging is comfortable and simple. I love products with such hygenic packaging . 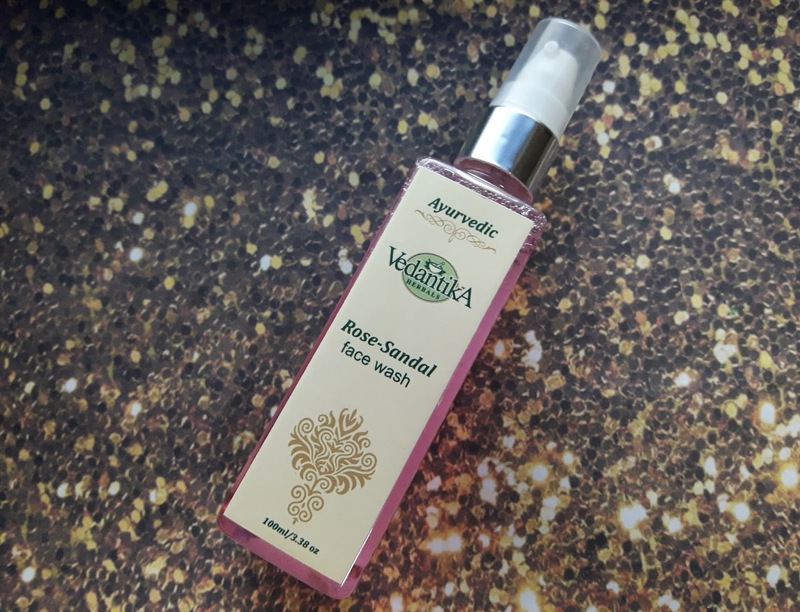 The face wash from Vedantika Herbals is a light rose coloured gel and it smells of pure rose and fresh sandal. The presence of Rose Flower Oil treats dry and sensitive skin. We all know about the sweet fragrance of sandal ,Sandal Wood Oil Draws out the excessive heat and keeps the skin cool. Aloe Vera Gel promotes cell growth and healing; extremely penetrates subcutaneous tissues and muscles for maintaining hydration. It has a soothing herbal scent which is absolutely sweet yet not over the top ,headache inducing. Its quite a runny clear in consistency texture. This Rose- Sandal Face wash has a mild rose fragrance similar to pure rose water,which is very soothing and relaxing.It is a gel kind of face wash which lathers very well. It cleanses the skin amazingly without leaving any traces of dirt and grime,making it squeaky clean.It is a moisturizing face wash which does not dry out post usage ,though I believe in moisturizing righ after using a cleanser,this facewash imparts a nice glow to the face.It instantly freshens and brightens up the face.It makes skin soft and supple.I have super sensitive skin this facewash lifts up my dull looking tired face.This face wash has never broke me out till date. Kolkata’s humidity is not easy to handle, therefore this facewash doesn’t help that well to combat shine or excess sebum.It will remove very light bb cream or light weight foundation. 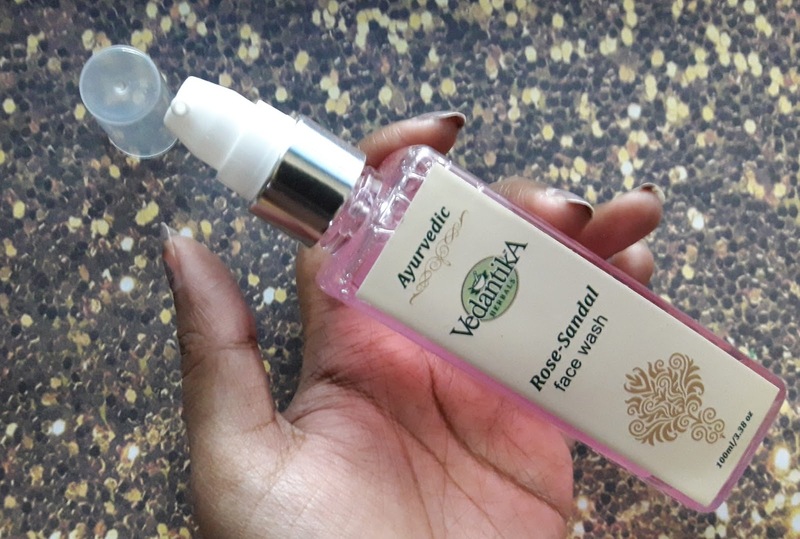 This Cleanser Cleanses the skin well,It has Mild and gentle fragrance. Very very hygienic packaging with Pump Dispenser, Comfortable packaging. 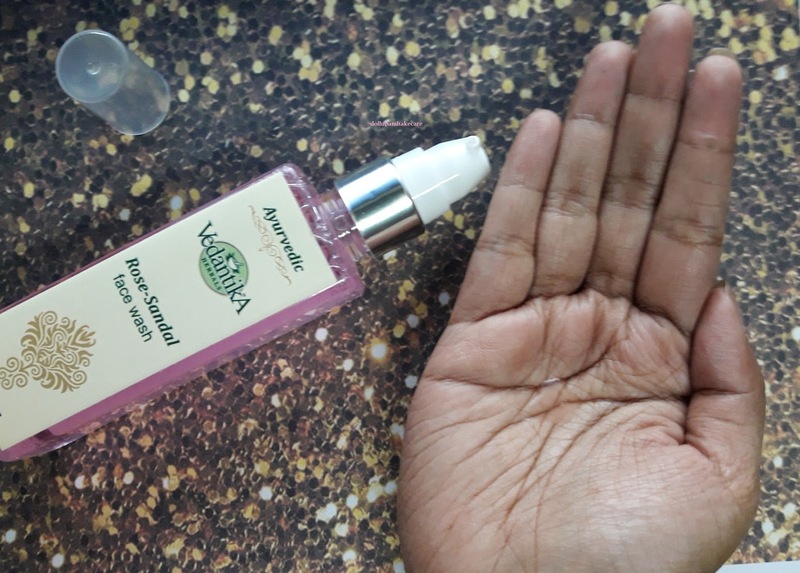 After using this facewash it imparts brightness and glow. No breakouts and irritations noticed yet. 100 % natural and organic. 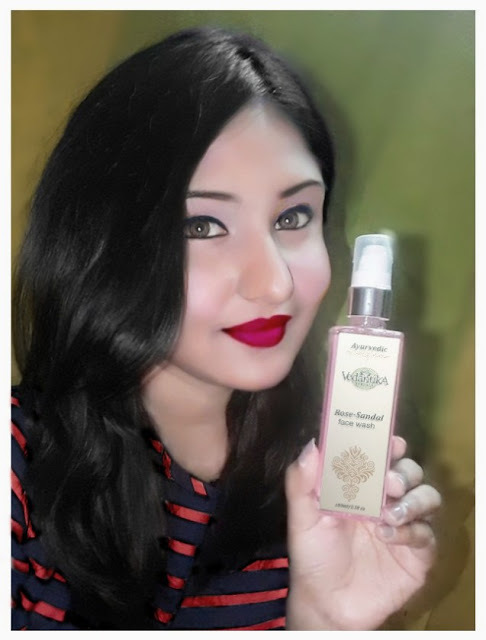 Natural ingredients makes skin feel better,comes with the goodness of Rose and sandal wood oil. 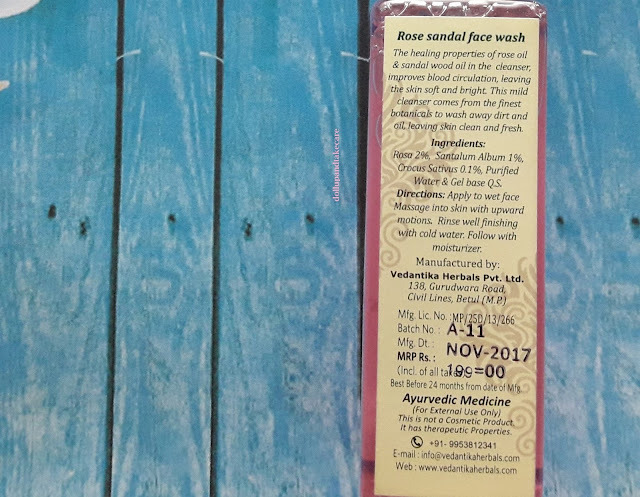 This facewash is Paraben free. Easy availability in all e portals. Honestly my skin doesn’t feel tight after using. Doesn’t help to combat shine and sebum during humid days .